One thing I love is race cars and not just the tough rigs that pound the quarter mile – I appreciate cars that can turn corners; can climb hills; can drift in plumes of smoke and cars that can run more than 300 km/h over 1000m. I also love modified car history, and well, the story of this speedway superstar is like a double yolker for me! I have never photographed a dirt slinger as a Street Machine magazine feature either, so I thought Brian McDonough’s ’65 fastback Mustang was a great start. 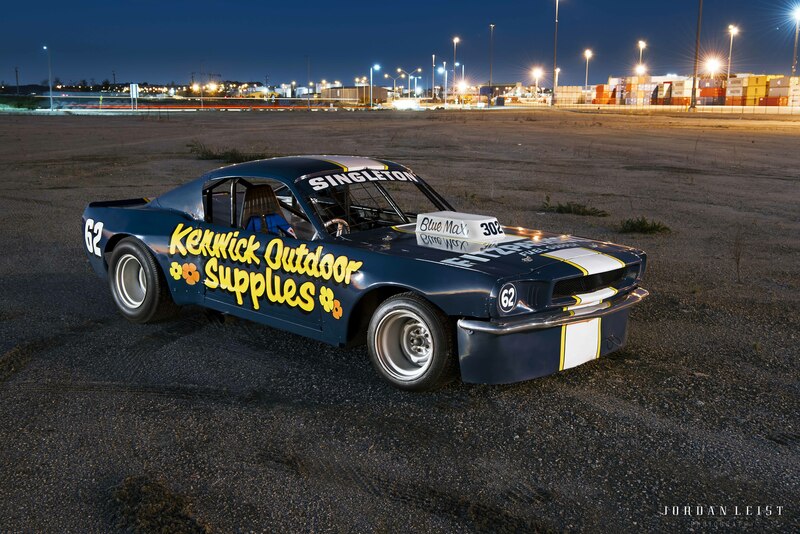 Being a Mustang aficionado and a long-time speedway fan, the rumour circulating of a classic racecar that once graced the hallowed dirt of Claremont speedway, was just far too juicy for Brian McDonough to let pass. “Of course, with the car being a Mustang my interest in the car was heightened and the fact that the car had been ‘missing’ for more than three decades made the hunt that little more exciting,” said Brian. After all the effort of finding the car, what was $1400? The boys went and grabbed a trailer and loaded it up to head back home. They were well and truly aware that the rebuild was going to take some real time and effort. “I knew all of the history about the car and one of its previous owners was John Singleton, a mechanic that I did my apprenticeship under back at Lynford Motors. For that reason, I wanted to restore it as close as possible to his old set up,” explained Brian. “The floor was that rusted out it just wasn’t worth wasting time on, so Mick said we might as well cut it out and start again. In reality, the car had been that butchered that it didn’t really matter if we made a few changes here and there. It’s still got the Falcon towers and suspension it copped when Barry Blake raced it but Mick decided to make a new crossmember and repaired all the chassis too. Seeing as I really wanted to drive the car, Mick suggested that we re-work the back-half of the car. It is just perfect now – when you stab the brakes, it instantly throws the car sideways, which gives you a good lead into the corner, just the way it’s supposed to be. On the track you steer it with the rear tyres because it’s got 5.67 gears in it, so it loves to rev – and it goes like buggery!” laughed Brian. Strangely enough – and much to my surprise – the car runs the factory gearbox, not the expected dog box. The car used to have a Chevy 10-bolt diff in it because they offered more ratios back then but that was never going to stay in the car with Brian in charge. A 9-inch now takes up residence back there. With all the mechanical issues taken care of, it was then just a matter getting the aesthetics improved upon. It was Jeff and Mark Allen who were enlisted to get the fibreglass panels sorted. “Every owner kept the moulds, they were a bit ugly but they did the job. Mick and myself made the mould for the grille and we modified the bonnet. The guards and door panels are similar to a ’69, which I think are probably the same moulds that Stan Starcevich used when he built his one,” explained Brian. Brian can’t actually race the car but he can put on demonstration runs at regional tracks and that is still pretty damn cool. To see the car driving around me at the photo shoot was a real blast but it made me think just how awesome it would have been to see the car strutting its stuff back in the 70s against a field of similar cars. I thank Brian and Mick for rescuing a piece of motor racing history and allowing me to photograph it.